Published on February 8, 2018 in guest post. 2 Comments Tags: baking, bread, chinese, hong kong, new york, pork. An assortment of Chinese pastries. All photos by Dressler Parsons. I’m so excited to share this post by my lastest intern, Dressler. She’s launched a blog called Bitter Butter: The Unsweet History of Pastries and you can also hire her for all things copywriting. “That’s $12.50,” said the woman behind the counter. Sarah and I exchanged a look. We had just spent the last several minutes poring over the long glass pastry cases in her neighborhood Chinese bakery, scrutinizing the fluffy rolls and imagining all their possible fillings. In the end, we’d selected 10 pastries, hoping to cover all our bases. We carried the goodies back to her apartment in paper bags. But once I started digging into it, “Chinese bakery” started to feel like an oxymoron. Historically, Chinese pastries weren’t baked–they were steamed. But all the treats in our paper bags had definitely seen the inside of an oven. So if traditional Chinese pastries aren’t baked, what are these pastries and where are they coming from? Even today, there are a ton of blog posts and forum answers warning you (or, primarily, American expats) that ovens in Chinese kitchens are hard to come by–because Chinese cuisine gets along fine without ‘em. All the cooking can be done on a stove top: frying, braising, boiling, and steaming. 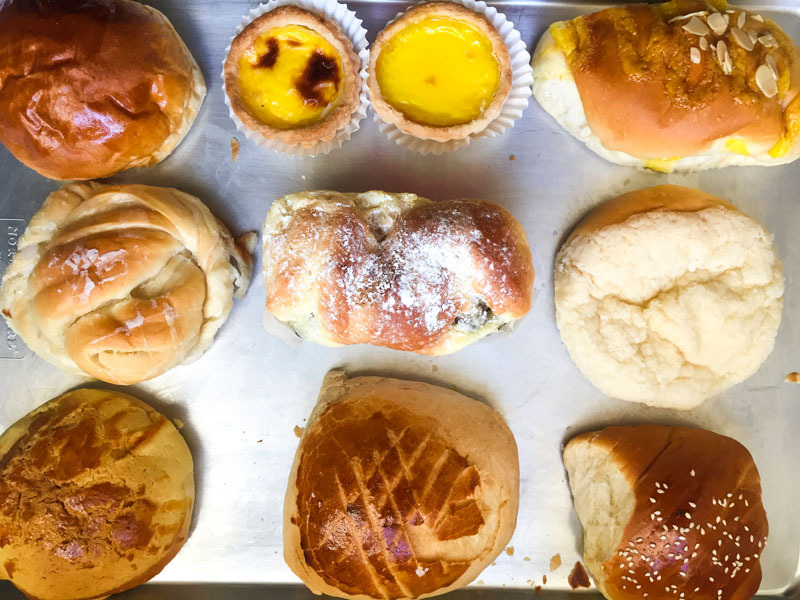 The bakeries in New York’s Chinatown, where Sarah lives, are technically Hong Kong-style, even though they’re referred to broadly as “Chinese bakeries.” And Hong Kong has felt, firsthand, the strong grip of Western influence. Hong Kong was under British rule beginning in 1842, but in the 1980s, China decided they wanted to take Hong Kong back. A pretty reasonable request. Geographically, Hong Kong isn’t exactly Britain’s neighbor. The main reason why this was even a debate was–like many things–purely political. China was/is a Communist country, and even though they laid out a plan to keep Hong Kong a sovereign state, Former British Prime Minister Margaret Thatcher was all I don’t know about this one, and But HOW will I explain this to the children colonized people of Hong Kong? Regardless, China did take Hong Kong back, and Thatcher figured out some way to explain the ensuing Sino-British Joint Declaration of 1984, which announced that Hong Kong would slip away from British rule and run back into the arms of China beginning July 1, 1997. The history of British rule alone at least partially accounts for the baking. After all, we know the Brits and their love of baked goods. But what about the bread itself? If you’ve never been to a Chinese bakery, go now, order any roll, and then come back. I’ll wait. The bread has an usual texture, yes? 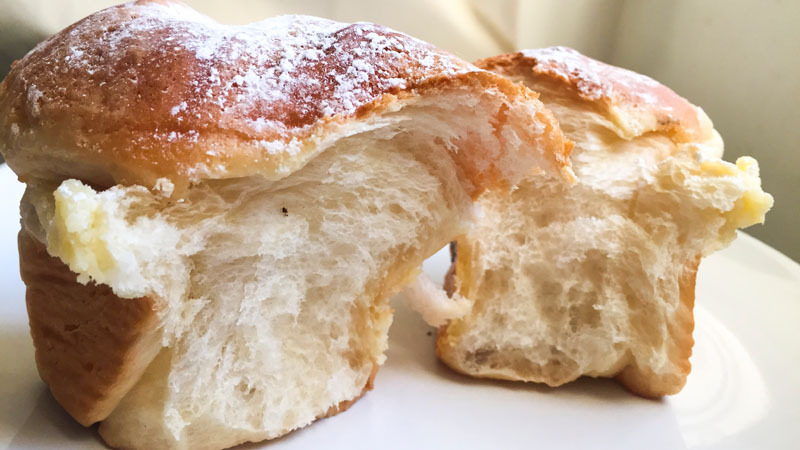 This soft, gummy, chewy bread is bizarrely fluffy, intriguingly addictive, and has even been scientifically studied. And the source of this texture is called a tangzhong starter. The tangzhong starter is also sometimes called a “roux starter,” which basically means that instead of the traditional bread-baking process (mix together flour, water, salt, yeast; knead it, let it rise), you add an extra step in, where you heat flour and water in a saucepan and whisk them together until they form a paste. Once it cools, you add it to the rest of the ingredients, and your little roux works its magic. It’s called gelatinization, and I think it’s a fascinating process. The type of bread that uses tangzhong starter tends to be called Hokkaido Milk Bread, after a region in Japan known for its dairy products. If you’re curious to try out this tasty, tasty bread, here’s a basic recipe from Yi of Yi Reservation. A good example of milk bread from a Hong Kong style bakery. So where is Hokkaido milk bread from? Guess who was under Japanese rule for a hot second? Hong Kong! This was during WWII, from 1941-1945. The tangzhong starter technique is allegedly Japanese, which means it could have entered Hong Kong’s culinary lexicon during this period. And the technique having a Japanese origin tracks; after all, Japan has also had its fair share of western culinary influence. In the 16th century, Portugal made contact with Japan and opened up trading ports (and started a slave trade). Japan traded exclusively with Holland (and China) from 1641-1853, and then opened up trading ports to the rest of the “Western World” in 1859. The Japan-US Treaty of Amity and Commerce also meant that American merchants were settling into Japan, so some manner of culinary exchange was definitely taking place. Also, Japan definitely has its own breadbaking technique called Yudane. It’s not an exact match–Yudane is a mix of flour and hot water, but they’re not whisked together into a roux. Instead, boiling water is poured over the flour, the mixture is chilled overnight, and the rest stays the same. It’s not clear if Yudane is older than Tangzhong, or a more modern adaptation. If the tangzhong technique truly is originally Japanese, it might have been popularized in China by Taiwanese baker Yu Fen Chen. Taiwan itself was colonized by the Dutch and later controlled by China, Japan, and then China again until 1975–so they’re pulling from a familiar cauldron of influence. As far as Chen goes, she wrote wrote 65℃ Bread Doctor, referring to the temperature at which the roux works its gelatinous bread magic. It’s a little unclear what, exactly, the timeline was for this book. It seems like it was published in 2014, but it’s possible that Chen was spreading the technique before her book was published. She’s certainly enough of a celebrity chef now to appear on TV and teach pastry lessons. The Chinese book title gets translated into “65 Soup Kind Of Bread” when put through the Google Translate wringer, which could be read as a deep mistranslation–but I don’t think it is. This is because cookbook author Peter Reinhart refers to the “Chinese soup seed technique” in his Whole Grain Breads book, which suggests that “soup bread” or “soup seed” is another possible name for tangzhong starter. And that might sound weird, but it’s actually not–since a roux is the basis for most cream-based soups, it’s not a “leap” so much as the next logical step. Most importantly–how tasty were those pastries? 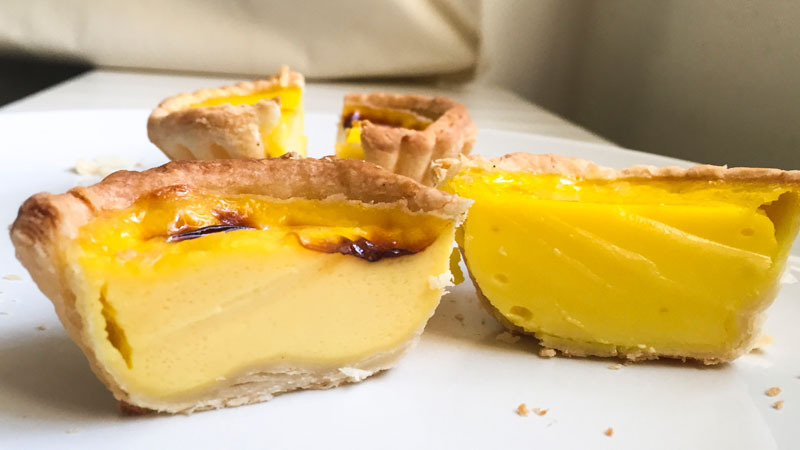 Back in Sarah’s apartment, we studiously cut up, photographed, and took notes on the pastries–trying to eat the warm ones first, but aware we were fighting a losing battle. 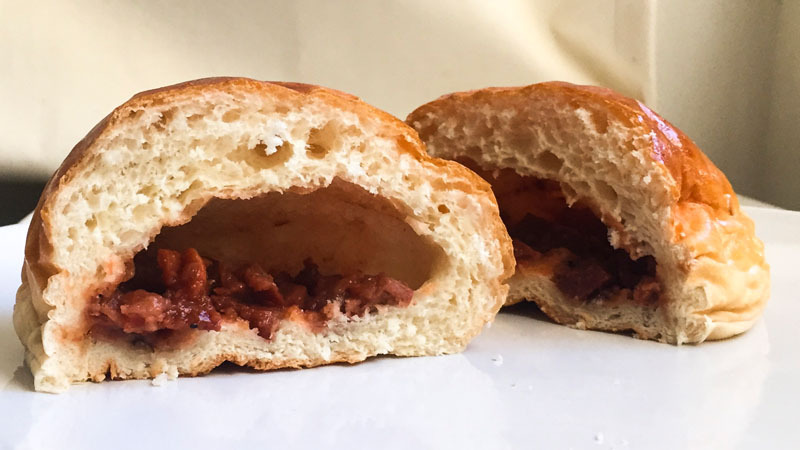 The pork bun was the first pastry I tried, and my favorite–I grew up on barbecue, so there was something kind of homey about the chopped pulled pork smothered in a sweet, tangy sauce, in a roll that tasted almost like a Hawaiian roll. But fluffier. I liked it so much I legitimately forgot we had 9 more pastries ahead of us, and would’ve finished it if Sarah hadn’t leapt to my rescue. But as we moved into successive pastries, most of the rolls with intriguingly varied names and designs were just…bread. Extremely delicious, fluffy, chewy bread, but still. That being said, it amazed me how these pastries quietly painted such a complex history of colonial rule, trade, and immigration. The fluffy “Danish Milk Grape” and “Swedish Roll,” and the cookie top on the Pineapple Bun and Lemon Bun (neither of which were filled with their names, bee tee dubs) all speak to trade routes and occupation, to colliding culinary influences. It was a little overwhelming, later that night, to think about the full journey of these pastries–their ingredients, techniques, and recipes. In a sense, they had made their way from Japan, through Taiwan, to Hong Kong, to Manhattan. And finally, they were in my apartment in Brooklyn, where I wrapped a leftover bun in a damp paper towel, stuck it in a microwave for 20 seconds, and enjoyed the warm, spongy bread with a pat of butter. Published on December 27, 2015 in podcast. 0 Comments Tags: chinatown, chinese, msg, umami. Good questions–and ones I answer thoroughly in my book. But in the meantime, there have been several great recent podcasts that address those questions and concerns. I’ve rounded them up here so you can binge-listen and draw your own conclusions! Stuff You Should Know: How Umami Works! For millennia humans have recognized four tastes, but in the 1980s a fifth taste first isolated in Japan gained worldwide acceptance – and took off like a rocket! Learn about meaty, musty, savory umami in this episode. Includes a history of MSG and explanation of it’s savory taste. Listen Here! Get the low down on MSG’s long-time association with Chinese Food. Wander into any town in the U.S., no matter how small and remote, and you’re likely to find at least one Chinese restaurant. In fact, there are more Chinese restaurants in America than McDonalds, KFC, and Burger King combined. And the food they serve is completely unlike anything you’ll find in China. In this episode of Gastropod, we ask one crucial question: why? This is an oldie but a goodie from me & Soma; the full history and sciense of MSG!